In recent years, communities of believers have developed across the United States and the world. They call themselves new monastics and have modeled their communities after the early Church of Acts. These communities are breathing life back into crime infested, neglected neighborhoods and in the process are loving these oppressed residents to Jesus. These new monastics are changing the world, one neighborhood at a time, simply by loving as Jesus loved. Their Relationship with God: The first part of this passage tells us how the believers in the early Church grew in their relationship with God. Their relationship with God came before everything else. They took the time to nurture their relationship with God corporately and I’m sure individually, as well. The early Christians knew that unless they had that intimate relationship with God, everything else would be meaningless. 1. They Devoted Themselves: According to www.merriam-webster.com, the definition of devoted is to have a strong love or loyalty to something or someone. 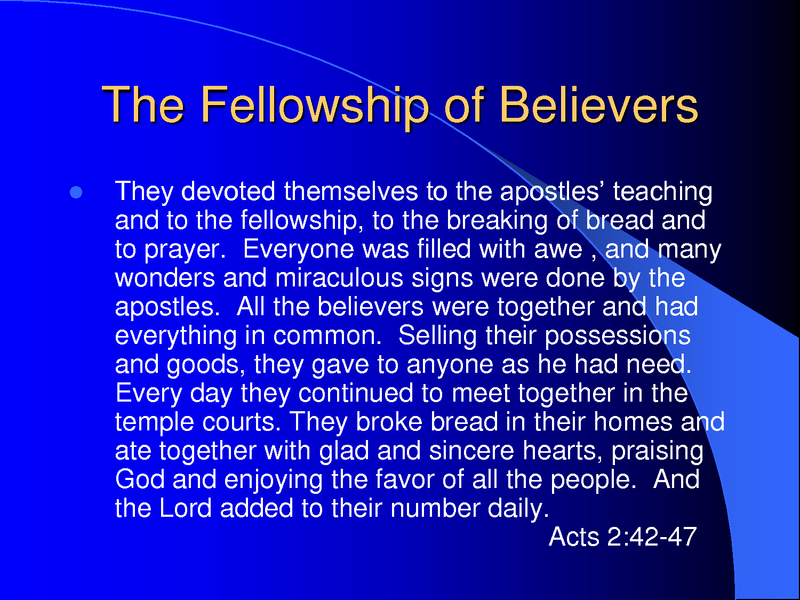 To the apostles’ teaching– The early believers had a strong loyalty to the apostles. They believed that the apostles spoke the truth of God and that they were anointed by God to preach and perform miracles. The early believers listened to what the apostles had to say. More importantly, they applied what they heard to their own lives and obeyed what the apostles said. They knew that God spoke to them through the apostles and they were obedient to God. Who are the “apostles” in your life? Do you listen to them and apply what you hear to your everyday life? Do you listen to their advice and words of wisdom? Or do you hear the words, but do your own thing anyway? To the fellowship– According to http://www.merriamwebster.com, a fellowship is the relationship of people who share interests or feelings. The early Christians had a strong love for God and that translated into their relationships with each other. They loved each other and were loyal to each other. Did they bicker? I’m sure they did. They were human, just as you and I are, so I’m sure that they weren’t always nice to each other. I’m sure they didn’t always see eye to eye on important issues, but that didn’t change the fact that they still loved each other. Because they had such a strong love for each other (were devoted to each other) they were able to look past their differences and see each person for who he/she really was, a child of God. 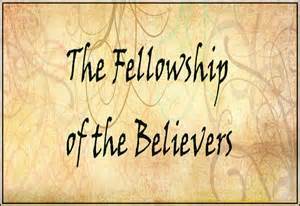 Who are the people that make up your fellowship? Are you devoted to them? Are you able to forgive and forget when someone hurts your feelings or makes you angry? Are you able to see past the hurt and anger to who that person really is, a child of God? To the breaking of bread– What is the “breaking of bread”? The phrase “breaking of bread” has been used in two different contexts. The first context is the sharing of a meal as found in Acts 27:33-38. The second context in which the “breaking of bread” took place was in 1 Corinthians 11:24-26, when Jesus performs the first Lord’s Supper. After doing some research and reading, I tend to agree with what I read on http://www.biblequestions.org/archives/BQAR143.htm, that verse 42 is talking about the Lord’s Supper. This verse is talking about the believers’ devotion to different ways of worship and communicating with God. It makes sense then that they would be devoted to the Lord’s Supper, in remembrance of Jesus. If they devoted themselves to the Lord’s Supper, then we can assume that they participated fully, out of love for their Savior. Do you fully participate in the Lord’s Supper, or are you only half present, your mind on other things? Do you really allow yourself to “feel” the pain that Jesus felt at the time of His crucifixion, or do you distance yourself from the thought of it? To prayer– The early believers knew that prayer was a major component in a relationship with God. It is the way we communicate with God. This passage doesn’t say how they prayed, but I’m sure they prayed corporately, as well as, individually. They were diligent about keeping prayer part of their daily lives. How diligent are you about making prayer part of your daily life? Do you have an active personal prayer life? Do you join with the “fellowship” to pray corporately? Do you communicate with God, as often as, you communicate with others in your life? Their Relationship with Others: Our relationship with God should always be our number one priority, but as we see in this passage, the early believers, were also dedicated to each other. If we fully devote ourselves to God, then our love for God will flow over to the other areas of our lives. We may not always like each other, but we will still have that Godly love for each other and will care about the welfare of our fellow man/woman. If the fire of God is burning deeply within us, then we will want everyone around us to experience that same relationship with God. We will want to share our love of God with others. 1. They Were Together– They did not try to do things on their own. They each acted in a way that benefited the fellowship. Did they make mistakes? Of course they did. Did they get on each others nerves? Of course they did. They weren’t perfect, but they practiced patience, mercy and grace. They loved each other, as they knew God loved them. Do you practice mercy when someone makes a mistake? Do you show grace to that person who has messed up? Or do you hold a grudge, swearing never to speak to that person again? 2. They Had Everything In Common– They shared what they had. I’m sure that some of them came from wealthier families and had more resources than the others, but still they shared, so that everyone had enough and no one had to much. Equality was important to the early Christians. I’m sure it wasn’t always easy to share what they had, but they did, because they loved each other. Do you share what you have with those in your church or community? Or do you selfishly hang onto your possessions because you may need them some day? 3. They Sold Their Goods, Giving To Those Who Had A Need– This is HUGE!!! Not only did they share what they had, but they sold what they had and gave the money to those who were in need! They did not hold onto their possessions, because they knew that their material possessions were only temporary. They practiced the art of sacrificially giving, because they loved each other. They all had what they needed. No one had to live in poverty. No one had to go without food, clothes, shelter, etc. because everyone shared what they had. Have you shared a material possessions recently with someone in need? If yes, did you share that possession because you didn’t use it. or did you share it even though you did use it and maybe used it often? Have you sold something and given the money to someone who had a bill to pay or needed food? Or do you store up your possessions because you may need them someday? 4. Every Day They Continued To Meet Together In The Temple Courts– I know what your saying, ” I’m to busy to meet everyday in the temple courts.” I hear you and I know that in this day and age, life can be hectic. Who has the time to meet EVERY DAY in the temple courts? If you are devoted to God and the fellowship, then you will find a way. I’m sure these early believers had jobs and busy lives too, but they made it a priority to meet ever day in the temple courts to worship God corporately. The passage doesn’t say how long they met, but they did meet for a portion of each day and gave that time to God. Are you willing to give up some time each day to meet with other believers to worship God? Or are you going to selfishly hang onto your time and not allow God to have what is His anyway? 5. They Broke Bread Together And Ate Together With Glad And Sincere Hearts– In this context, it is obvious that breaking bread means sharing a meal together. They ate together, sharing that bond that comes from sharing a meal. They were thankful and they were joyful. They were sincere in wanting to do life together and I can’t think of a better example of christian living than that. How many meals do you share with those in your church/community? Are you thankful to have a community to do life with? Are you sincere in wanting to serve God and the others in your church/community? Or do you avoid the meals because these are not the people you want to be around? Do you wish you could do life with another group of people? 6. They Praised God– The passage doesn’t say they praised God on some days or only on the good days. The passage says they praised God, period! These early Christians praised God through good and bad. They had their ups and downs, like we all do and through it all, they praised God. They gave God the glory in all things. How often do you praise God? Do you praise God when things are tough or only in the times of ease and prosperity? In the midst of the storm, can you raise your hands and praise God for the trial? 1. Many Wonders And Miraculous Signs Were Done By The Apostles– People were healed, the dead came back to life, food appeared out of no where. God anointed the apostles and they were ON FIRE! God was using the apostles in a mighty way because of their obedience to Him. God still performs miracles and wonders, but we have to be in obedience to His will. 2. They Enjoyed The Favor Of The People And The Lord Added To Their Number Daily– Because of the obedience of the Church of Acts, God blessed them with the favor of the people. People were jumping at the chance to have what these believers had. Because they put God first, loved each other as God loved them, they set an example of what Christianity is all about and people responded to that. If you are a church pastor or leader, I am challenging you to encourage and empower your congregations to step outside of the church walls and reach out to your communities. I am challenging you to adopt a 1/2 mile or 1 mile radius around your churches and find out the needs of the community. Go out and meet the residents, finding out what they need and doing whatever it takes to meet those needs. Make it about building relationships, not just about getting people into your church. Don’t hide behind the excuse of not having enough resources to meet the needs of the community, remember that you serve a God of all resources. Jesus told us to “GO OUT” and we, as Christians need to start obeying what Jesus told us to do. If we reach out to our communities and treat our communities as our mission fields, we will be more effective in reaching the lost for Christ. Are you devoted to God? Are you devoted to the community around you? These are questions I ask myself and I am feeling the Holy Spirit convicting my heart. GO! and love people to Christ!